Last week my wife and I celebrated our fifth wedding anniversary. Below I tell our story in relation to her pursuit of and love for art. Seven years ago this punk girl entered my life. I’d seen her around church and learned she was in art school. When eventually we bumped into each other, we started chatting. 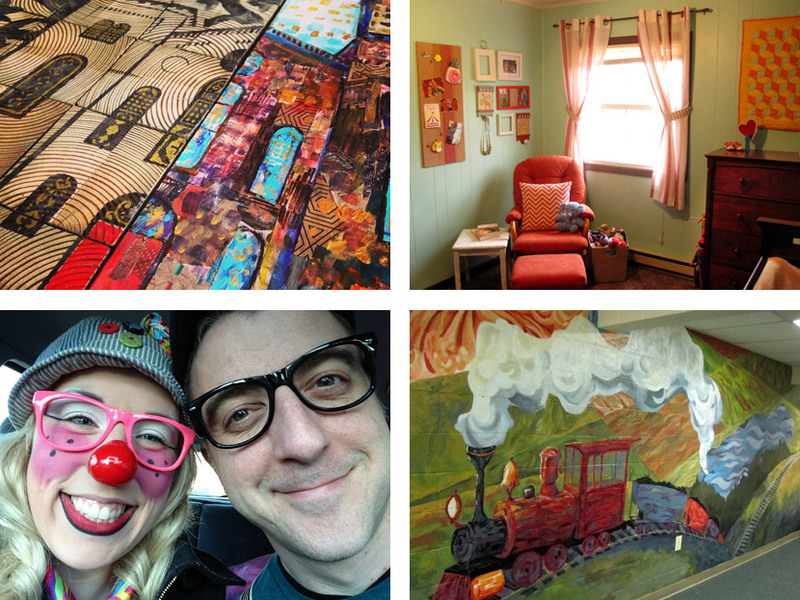 We talked art—specifically, we talked Frida Kahlo. Talking to her was easy. That’s not my norm. Soon I got a call. 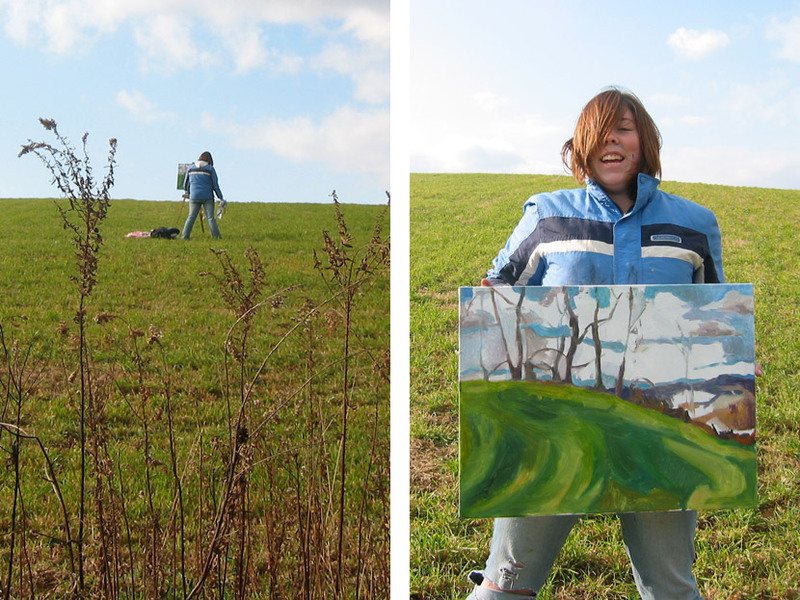 She wanted to do some plein air painting on my property. 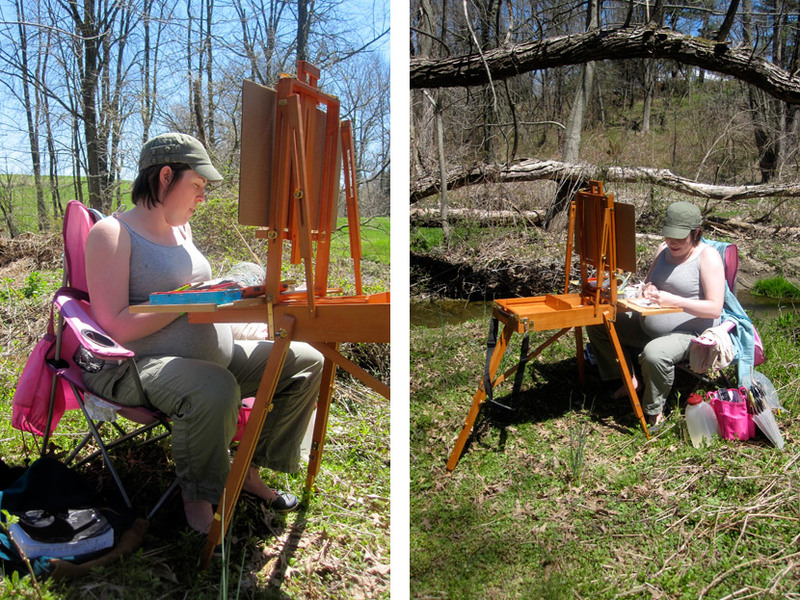 Climbing the meadow behind my house, she planted her easel and got busy. By the time she was done there was paint across her hands and face. Two years later we were married. Paint smudges on the face are still the norm. Love of painting quickly transformed into love of collage. But she also desired to be a plein air artist. The two just don’t mix. At least that’s what I thought. This wasn’t the last time she would prove me wrong. She developed a system involving glass jars and mesh bags that allowed her to create collage landscapes on site, even on fairly windy days. Her brush would be filled with glue instead of paint. Instead of overanalyzing everything, she simply tries. And while there is failure along the way, in the end she accomplishes much. 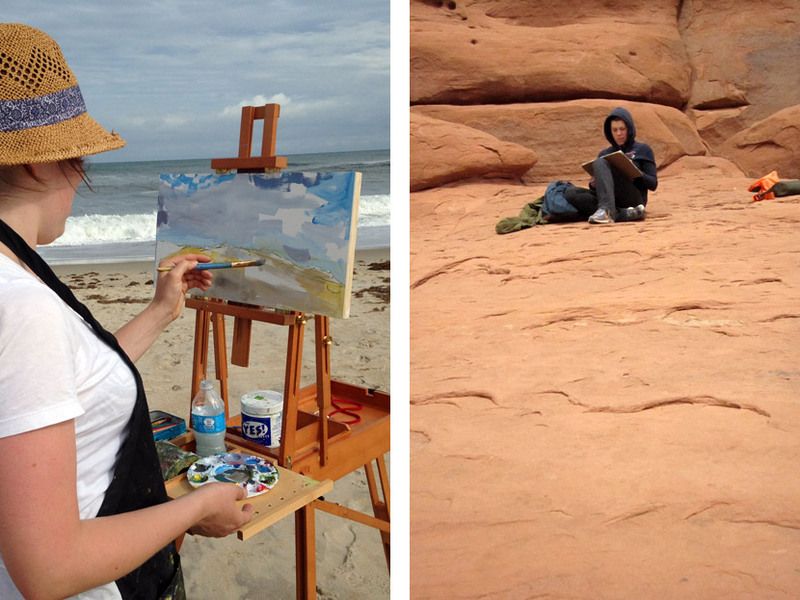 Plein air continues to be her passion. But there’s a season called winter which puts a damper on that. 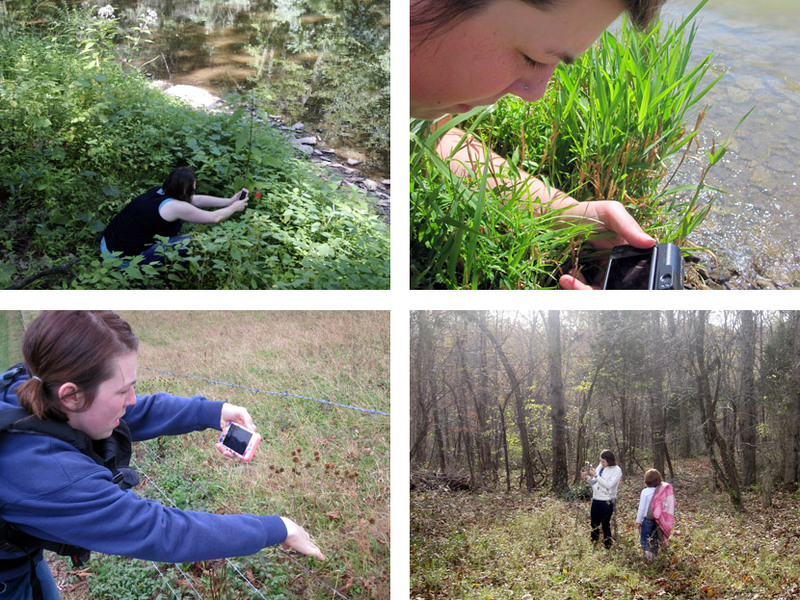 And as she is constantly on the lookout for the perfect scene, there are times a phone is the only tool available. She’ll break out her camera and start filling her phone’s memory with reference photos. I enjoy taking photos of her taking photos to fill my own memory with her. For her inspiration is God’s creation. I know few of her pieces that are compiled only from memory or imagination. She is an imitator of the master Creator and honors Him through her creations. She considers a field, and collages it: with the brush of her hand, she plants her strokes (with apologies to Proverbs 31:16). She takes initiative. She doesn’t wait for opportunities to fall into her lap. 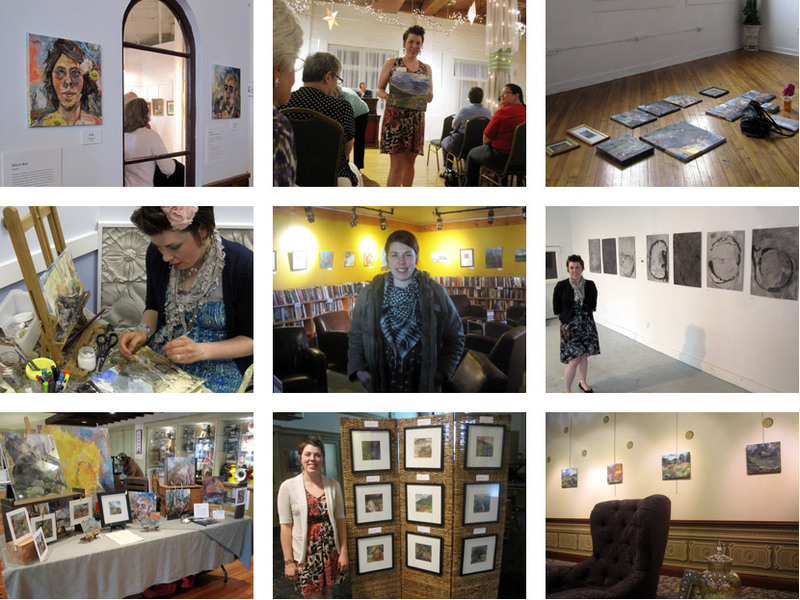 She’ll regularly contact venues about showing her artwork and as a result the times are rare when she doesn’t have a show—often there are multiple solo shows at one time. She sets up her easel and collages live during receptions. She makes paper segments and sells them; she delivers canvas to the galleries (with apology to Proverbs 31:24). Collaboration is the theme of any marriage. With ours it’s just a bit more literal. We create artwork together, we paint murals together, and we perform on stage together. She is married to someone who is very focused on one thing at a time, which means I can neglect giving her the attention she deserves. But those times don’t last long, for she is half of me—a beautiful, clever, artistic and loving half. And most importantly, we strive to collaborate in glorifying the one God who, through Jesus Christ, freed us from death and made us truly alive. Here’s to the next five years with my stunningly “fine” artist. Happy 5th, you lovely Soul Mates . we are honored to have you three in our lives. Thanks, Devvin. Always an encourager. We appreciate and love you two as well. Will meet up again soon. How beautifully written! Blessings to you both on many more wonderful years of marriage! Happy Anniversary! Happy Anniversary to you both! God molds us together perfectly with the mate He has chosen for us. And you both are molded together to honor and glorify Him. You couldn’t have said it better Jason! Congrats. So beautiful Jason. What a wonderful way to pay tribute to Kate and your marriage and honor the Lord at the same time. Shimrit, thank you for taking the time to write that piece of encouragement to a stranger. God bless you.